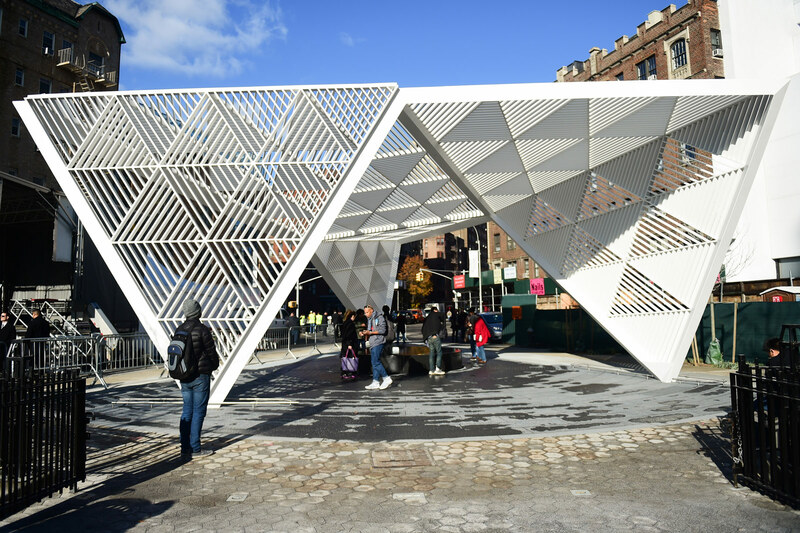 After five years of construction, the AIDS Memorial in the West Village at St. Vincent’s Triangle on Seventh Avenue was dedicated yesterday, December 1, for World AIDS Day. 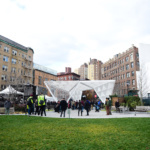 Community members and activists joined Mayor Bill de Blasio and city councilmember Corey Johnson to dedicate the park in memory of those who lost their lives or are affected by AIDS. The dedication included a performance by the Gay Men’s Chorus and the names of those who died as a result of AIDS. 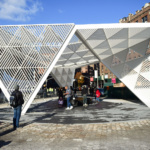 The memorial was designed by Brooklyn architecture firm Studio a + i and features an 18-foot metal canopy made from three connected triangles. 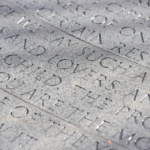 Artist Jenny Holzer engraved Walt Whitman’s poem, “Song of Myself” in the granite pavers beneath the canopy—her first permanent installation in New York City. It is appropriately located across the street from the former St. Vincent’s Hospital, the second dedicated AIDS clinic in 1984, and is less than a block away from the LGBT Community Center on 13th Street. Although the hospital was converted to condos by the Rudin family and Global Holdings after it closed in 2010, the building is still remembered as being on the forefront of the AIDS crisis. 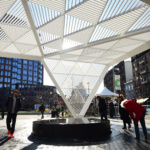 The memorial itself came to fruition in part thanks to the efforts of Christopher Tepper and Paul Kelterbrn, who started the NYC AIDS Memorial organization in 2011 and raised more than $6 million to make the monument in honor of those who suffered from the disease. “There are no definite dates or victims. In our design process, we emphasize the changing and varied ways through which AIDS affects us personally and as a society,” Studio a + i said on its website. The memorial will also feature a park and a water feature designed by Rick Parisi of M. Paul Friedberg & Partners with Manhattan-based company Rudin Management, offering repose and reflection to everyone.